Sickweather engaged with DATALEAP to provide continual data science support for their patent-pending process of extrapolating illness information from Twitter and other social media streams. DATALEAP designed a multitude of products and processes that directly enhance Sickweather’s analytic capabilities. 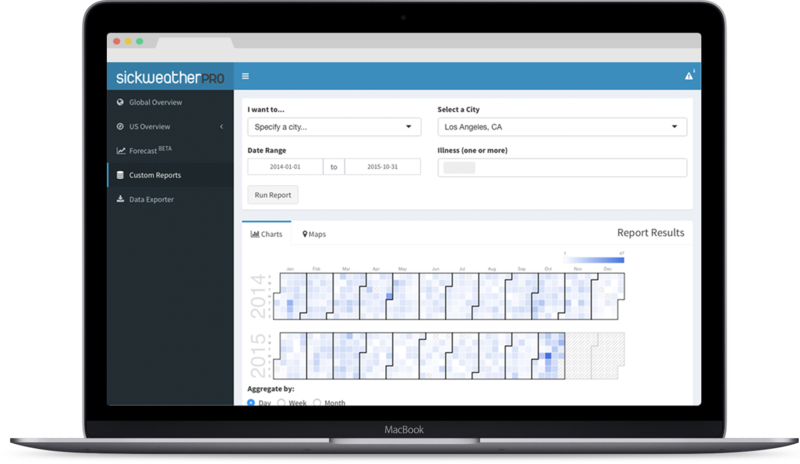 From high-speed reverse-geocoding systems, to an R-powered dashboard for their Sickweather PRO offering, DATALEAP continues to work with Sickweather to increase their market presence and bottom line. Sickweather collects millions of illness reports from social media websites like Twitter and Facebook. This data is useful for a multitude of enterprise customers, from marketing and pharmaceutical ad agencies to local government and school administrators. To increase utility of this data, Sickweather required a real-time data visualization and analysis platform that can be used not only internally, but also exposed to outside customers and partners. DATALEAP developed an interactive, data-driven dashboard using R as an analytical platform. The use of R as a server-side analytics engine enabled Sickweather to go beyond simple data visualization and laid the foundation for future complex modeling and analysis. Our solution combines many R functions and packages that enable the production of interactive tables, charts (bar charts, calendar charts, time series charts), and maps (both thematic choropleth and point maps) using on-demand data extraction and analysis. Further, we were able to cut the development and implementation to a fraction of the cost normally encountered in complex data visualization development. Sickweather is the “doppler radar” for sickness. Sickweather’s algorithm scans social networks for indicators of illness, and allows you to check for the chance of illness as easily as checking for the chance of rain. DATALEAP’s expertise was key to further developing many of our market leading products, from enhancing our illness classification algorithm, to our ability to better analyze and interpret the millions of records that Sickweather processes. Our most recent endeavor resulted in our Sickweather PRO Enterprise Solution, which DATALEAP took from abstract to implementation. Delivering on time and within budget, Bogdan and DATALEAP are always a reliable source to turn to for data related projects, often uncovering the missing link in the process and removing any bottlenecks. Best of all, they are easy to work with and communicate clearly, so there aren’t any surprises. It’s been great working with Bogdan and DATALEAP and I strongly recommend their services for any data-driven organization. Data analytics, healthcare research, GIS, data visualization.